This movie does the purpose of a horror movie, that is to scare you with loads of special effects. If you ask me there are two things horribly wrong with this movie, No 1 Daniel Radcliffe a young father??? Now there’s title for a fantasy book. No 2 the story isn’t that great, well the story is adapted for a novel of the same name maybe that transition from book to movie is not that good, don't know what went wrong. I mean in the beginning they show that it’s because of Harry Pott…. Oh sorry, I meant Arthur Kipps (Daniel Radcliffe) is the cause of the entire problem, that it’s because of him the woman in black is causing all the havoc, which makes you believe that there is some deep seeded meaning to the whole story, but there’s none. Here’s the gist, A young layer Arthur Kipps is sent to manage the estate of Alice Drablow, who owned Eel Marsh House of England. 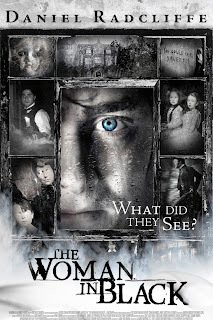 As soon as he gets there he is unwelcomed by the locals but he just wants to do his job, so he goes to the Eel Marsh House and discovers that there is some supernatural phenomenon in that house, the woman in black. The rest of the movie is how he tries to figure who the "woman in black" is and what she wants, this part doesn't really make much sense, even lesser sense than portraying Daniel Radcliffe as a father. Oh, I forgot to tell you, there is secrete No 3 as to why this movie isn't that great to watch and that is the acting performance given by Daniel Radcliffe, bravo Daniel bravo.